Will the Salt Valley Drill Rig Topple Landscape Arch - A Symbol of Moab, Utah? In July 1965, my father and I visited the old Arches National Monument. Dutifully, we drove the newly paved road, which ended in a circle at the Devil’s Garden. My DeLorme Utah Atlas & Gazetteer says of the place, “Area containing most of the park’s rock formations. 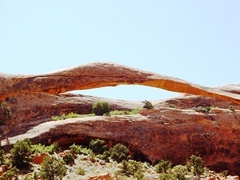 Landscape Arch, at over 300 feet, one of the world’s longest known natural spans…” Although there are plenty of other rock formations in the park, including the grand Courthouse area, the Devil’s Garden does have a high concentration of the rock fins and arches that visitors like to see. Saving his valuable Ektachrome film for the important vistas, that day my father splurged and took three shots of Landscape Arch. With an reflex camera, judging the light was always an issue. After development, only one of three slides “came out”. Since it predates massive rock falls in 1991 and 1995, that 35-MM slide is now an historical artifact. Viewing the first image of the arch on this page, you will see the famed arch in 1965. In the second image, you will see evidence of water seepage on the fresh rock face. This may be an indication that the freeze-thaw cycle had loosened a layer of stone, which fell from the right-underside of the arch. Forty-three years later, in May 2008, I made my second pilgrimage to Landscape Arch. Ironically, the afternoon light that day again made it difficult to get a good picture of the arch. The western sky was so bright, that that it overwhelmed the contrast ratios available to my Sony digital camera. Of my many Landscape Arch photos that day, only one “came out”. 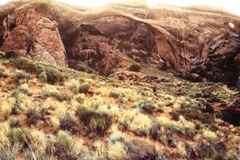 Until the 1991 rock fall, access for hikers below the arch was unfettered. During the rock fall itself, an amateur videographer caught scenes of picnickers scrambling to avoid burial under tons of rock. Since that time, we have learned that sound waves generated by normal human activity may contribute to spontaneous destruction of both natural arches and ancient Indian structures. Anywhere that there is a stone amphitheater large enough to concentrate sound waves, there is potential for destruction. According to the Old Testament, during the Israelites’ conquest of Canaan, the trumpeters in Joshua’s army alone brought down the walls of Jericho. In the waning days of 2008, the George W. Bush administrations announced the largest ever auction of oil and gas leases on federal government land. Around Moab, Utah, many people were incensed. Through a series of gaffs and blunders, the land above the Spanish Valley Aquifer was included in the proposed sale. Residents just outside the city limits discovered that the federal government owned their mineral rights and was about to sell them to the highest bidder. For several years, the G.W. Bush Administration had granted near-unrestricted drilling rights throughout the West. However, their inclusion of BLM land within view of Arches National Park was the Coup de Grace. Doing so put every remaining arch at Devil’s Garden in jeopardy. Disturbed by the administration’s cavalier proposal, I created a YouTube video titled, “Drilling Rigs Could Topple Landscape Arch”. Soon after the November 2008 elections, President Obama appointed Ken Salazar, formerly a Senator from Colorado to be his Secretary of Interior. Initially, environmentalists were skeptical of Salazar. Almost immediately, he blocked the most egregious of the Bush oil and gas leases, including any within sight of Arches National Park. “Case closed”, I thought. The arches at Arches were safe. 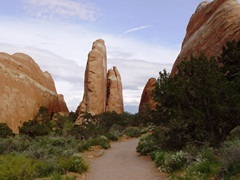 In October 2011, I again visited Arches National Park, accessing the Devil’s Garden area via the dirt and gravel of the Salt Valley Road. From U.S. Highway 191, north of Canyonlands Field, I exited on to the unmarked “Valley City Road”. Although there is no "Valley City", I soon saw an industrial drilling rig big enough to qualify. Although the drilling location is not within view of Arches National Park, it is clearly visible from U.S. 191. According to my map, the new drilling operation is less than twelve miles from Landscape Arch. Upon seeing the rig, its size and scale reminded me of huge exploration rigs used on the North Slope in Alaska. Standing alone near the entrance to the Salt Valley, the rig dominated the view of the Book Cliffs to the north. Immediately, I felt the implied threat to Landscape Arch. Upon returning home from Moab, I was amazed to read about a swarm of earthquakes in Oklahoma. After the devastating Long Beach Earthquake of 1933, California outlawed unreinforced masonry buildings. During the intervening years, Oklahoma was so geologically stable that new brick buildings were common. In November 2011, with twenty-three earthquakes occurring over a two-day period, it looked like more than a swarm. After thirty years without any significant seismic activity, why was Oklahoma fracturing like a dry biscuit? It may be instructive to remember that in 1933, the Signal Hill oilfield, near Long Beach was at the height of an oil boom. As of this writing, there is no definitive answer to the earthquake issue in Oklahoma. Anecdotal evidence points at increased exploration and production of oil and gas throughout the state. Oil and gas companies immediately issued denials that their activity could or had caused the series of seismic events. It would be nice if there was scientific evidence to corroborate their claims, but such evidence is lacking. In the search for new deposits of oil and gas, the extractors have perfected the art of hydraulic fracturing (fracking), or so they say. A recent documentary showed fracking-caused water well contamination in Pennsylvania. In some places, it was so bad that that affected residents could ignite the gas emanating from their water taps. While I was living in Denver in the late 1980s, the Rocky Mountain Arsenal used water-injection to dispose of plutonium-contaminated fluids. After a few years, earthquakes in and around the nearby city of Broomfield showed a marked increase. Whether it was spontaneous nuclear fission or simple lubrication of the underlying rock structures, no one knows. Suffice to say that when large-scale water injection at that site ended, so too did the earthquakes. Since hydraulic fracturing includes both injection and extraction of various fluids, it is audacious for extractors to deny any responsibility for the consequences of their actions. Here is what I do not know. I do not know the owner of the Salt Valley rig. I do not know if their slant drilling extends to the border of Arches National Park or beyond. I do not know if vibrations from exploratory drilling will affect the national park. I do not know if any future hydraulic fracturing or gas extraction could cause earthquakes within Arches National Park. Here is what I do know. Scientists usually discount any hypothesis until it is proven, one way or the other. Therefore, proof that my “drilling, fracking and earthquake hypothesis” is true will have to wait until the arches start to fall. On the other hand, maybe they already have. On August 5, 2008, Wall Arch fell at Devil’s Garden. At the time, smaller, mobile exploration rigs were at work in the Salt Valley. Until we know all of the facts, I shall rest my case on the evidence at hand.